Do you struggle with FOMO? Fear of missing out. I recently read an article where a guy talked about his fear of missing out. 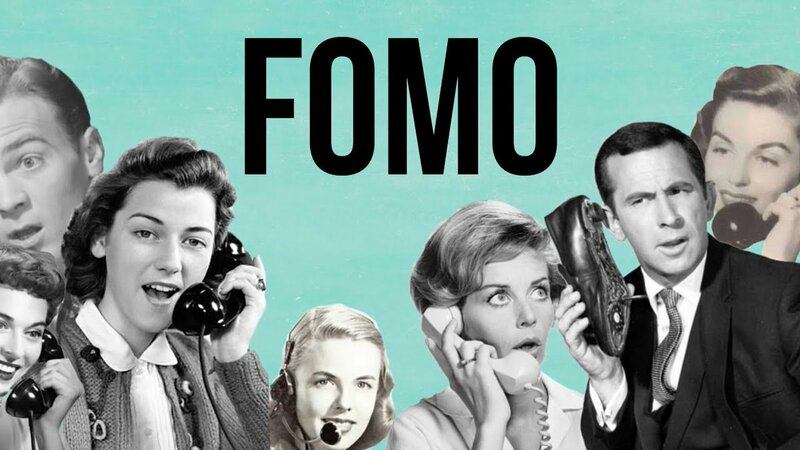 Because of the prevalence of social media in our society, and the quick access to social media accounts on our phones, FOMO is a real thing for many. The author of the article would see all these amazing photos people put on their social media accounts, and he would think, “That’s awesome, I want to see that too. I want to be able to post that to my social media account. I’m missing out!” He went so far as to spend thousands of dollars to visit exotic locations, just to get that ultimate picture of coolness so that he could post it on online to show all his friends. But something happened. When he actually went on made it to the exotic spot, it would be a cloudy day. Or he would get sick. Or there would be obnoxious tourists, all conspiring against him being able to get that perfect photo. He didn’t take stock of all the loads of details that you need to take into account when you are trying to achieve something momentous. Having a successful vacation takes a lot of work. You don’t just decide to go on vacation, and the next day go on vacation and have everything go perfectly. You have to think through all the details, working hard to plan it right. And then when you get there, the unexpected can take over and surprise you and mess up your plans. I think that is what was happening with the people of Israel in our next Advent Psalm of Lament. To review from last week, lament is a type of prayer, directed to God, asking God to intervene. In lament the pray-er is calling out to God with a passionate expression of grief or sorrow, like mourning, but deeper. In Psalm 80 last week, we heard the psalmist lament by repeating the phrase “Restore us, O Lord God Almighty, make you face shine upon us, that we may be saved.” Let us hear how a different psalmist laments today, Psalm 85. It seems like the author was purposefully using a structure when he put together this psalm. Today we’ll look at the first section, and then in the following posts we’ll work through the rest. In verses 1-3 the psalmist reviews God’s favor to Israel in the past. Look at verse 2 where he describes God dealing with their sin. A verse like that gives us a clue about that time period this psalm was written. It came after the people had sinned and God forgave them. There are many, many instances in the Old Testament that Israel had sinned. Which one is this one talking about? Scholars I studied suggest that the most likely event that the psalmist is referring to in verses 1-3 is the time when Israel was allowed to return to the land after the Babylonian exile when in 538 BC, Cyrus the Great of Persia, conquered Babylon, and allowed some of the Jews to return to Palestine, the Promised Land. The people of Israel had been in exile for 70 years. But God allowed them to return. That’s what we think verses 1-3 are all about. God showed them favor, restored their fortunes, forgave their sin, allowing a small group of them to return to their land. You can read about their return from exile in books like Ezra, Nehemiah, and in the prophets Haggai and Malachi. Guess what though? Just like the guy who wrote the FOMO article, when the exiles return to Palestine, they have a shock waiting for them. We’ll learn about that surprise in our next post.